CEPC offers a variety of trainings on practice transformation and implementing new models of team-based care. We currently offer four comprehensive trainings: Health Coaching, Panel Management, Complex Care Management, and Practice Coaching. The Health Coach, Panel Management and Complex Care Management trainings are geared toward training staff who provide direct patient care. Each of these three unique training curricula teach essential communication skills needed to work collaboratively with patients, as well as the content knowledge needed to work with specific patient populations. 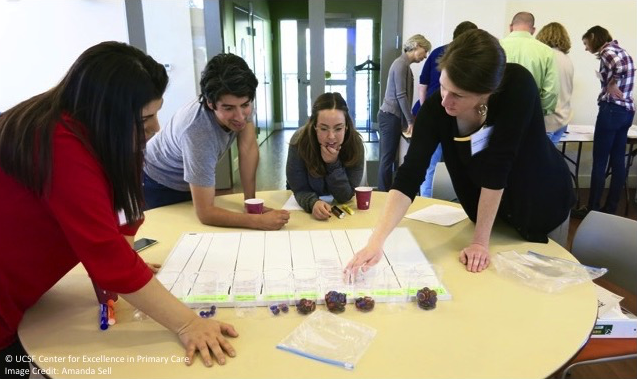 The Practice Coach training provides core skills required to guide practices utilizing the 10 Building Blocks of high performing primary care as their transformation roadmap. The training is applicable to both people who work within and outside the clinic. This training equips practice coaches to empower and support the clinic or practice to carry out quality improvement on their own. Trainings offered by CEPC are based on adult-learning theory and principles. Our highly-interactive and collaborative training strategy includes games, role-plays and problem-based case studies. During the course of the training, participants will practice new and receive feedback in real-time from trainers and fellow participants. Trainers encourage participants to draw on their personal experiences working with patients or clinic staff. At CEPC, we believe that training is necessary but not sufficient to transform practice. In order for new practices to “take root,” we have found that the ground must be fertile and the gardener must be vigilant. As a result, we conduct a readiness assessment with organizations interested in launching health coaching, panel management, or complex care management to ensure that they have the necessary infrastructure (e.g., standing orders) and supervision in place so that these new practices can be sustainable. Furthermore, after completion of training, we provide practice consultation to assist with implementation. In additional to these training modules, we provide support in management and staff retreats, team building and leadership development. If you are interested in having CEPC train you or your organization, please email us at [email protected].